One of the less-talked-about features rolled out at Google I/O this year was Google’s digital wellbeing initiative. Yes, it seems absurd, doesn’t it? A company that makes its livelihood out of people being stuck to their phones now wants you to take a break and smell the fresh air. Once rolled out, you can get access to the time spent on your phone, how frequently you use different apps, and how many notifications you get. If raw numbers don’t scare you, then the app timer lets you set limits on how much you use your apps. When you’ve reached that limit, the app icon is greyed out for the rest of the day. We’ve all ended up binge watching cat videos on YouTube, so an in-built deterrent is always welcome to keep such behaviour in check. 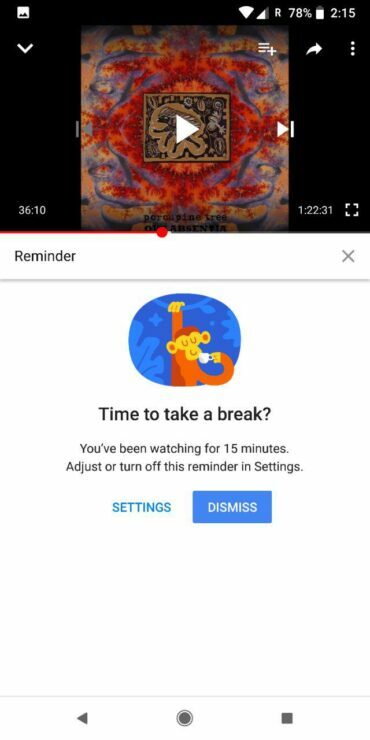 One of the YouTube-specific features was titled take a break, with which you could schedule custom breathers as often as you want, pausing what you’re currently watching and encouraging you to step away. 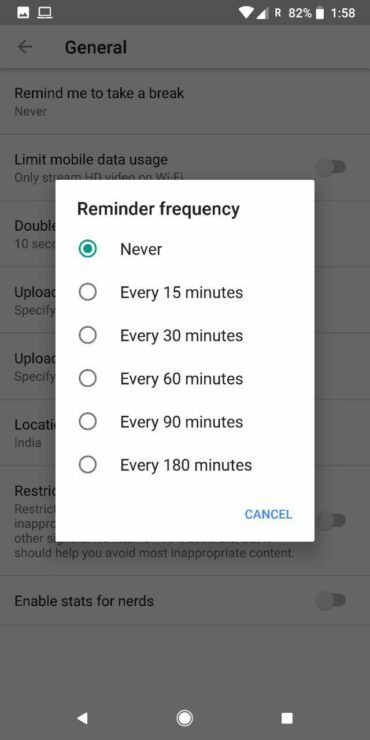 9to5google discovered that after updating their YouTube app to version 13.18.54, a new Remind me to take a break” option popped up in the settings menu. You can find this setting by tapping on your profile pic and then navigate to Settings > General > Remind me to take a break. 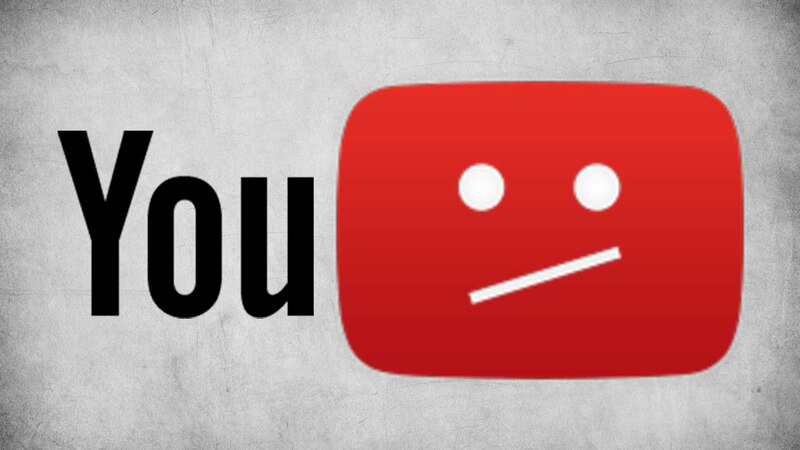 You can have YouTube remind you to stop watching every 15, 30, 60, 90, or 180 minutes. When you have reached that cutoff point, a reminder will pause your video and show an image of a monkey asking if you want to take a break. You can either dismiss the reminder and go along with your life or head into the settings to adjust the reminder. YouTube won’t forcefully stop you from continuing to watch videos, yet. 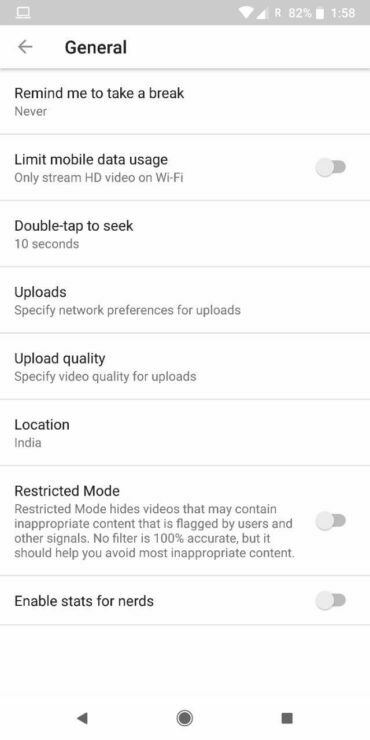 You’ll have to wait for the OTA to hit your device, and if you can’t wait, download the latest version of the YouTube app using this link. Nobody wants to admit it, but everyone is addicted to their smart device to a certain degree, and it’s best if we acknowledge it. There exist several third-party apps that shut you out of your device completely, but native support is always better.